ARDUINUS (ARDWYNE), there is no reliable information on this Saint extant, however there are those who say he was one of four English pilgrims who reposed whilst on a pilgrimage to Rome in the seventh century. St. Arduinus is venerated as the Patron Saint of the town of Ceprano. INNOCENT I, Pope of Rome from 402 until his repose 417. During his Pontificate Rome was sacked by the Goths under Alaric (410). St. Innocent was also one of the leaders in the condemning of Pelagianism. LUCIDUS, a monk at St. Peter's Abbey near Aquara, Italy. St. Lucidus reposed circa 938, and nothing further about his life is known. LYUTIUS, a monk at Monte Cassino, who spent his last years as a hermit at La Trinità della Cava near Cava de' Tirreni, in southern Italy. St. Lyutius reposed circa 1038. Nazarius, Protase, Gervase and Celsus. And by their contest dispelled the worship of idols. Through their prayers, O Christ God, have mercy on us all. NAZARIUS and CELSUS, (on Eastern Calendars 14th October with SS. Gervase and Protase), two martyrs in Milan who were beheaded on the orders of Emperor Nero circa 68. According to a legend of dubious veracity, St. Nazarius was a son of Perpetua, a disciple of the Apostle Peter, who also catechised St. Nazarius. PEREGRINUS, (Second Century), very little information on this saint remains, he seems to have been a priest of the Diocese of Lyons in the time of St. Irenaeus (28th June), who in the latter half of the second century lived as a hermit on an island in the River Saône. SAMSON (SAMPSON), one of the greatest missionaries of the sixth century in western Europe, St. Samson of Dol evangelised for Christ in Ireland, Cornwall, the Channel Islands, and Brittany. A Welsh monk, St. Samson began as a disciple of St. Illtyd (6th November) at his great nursery of saints, Llantwit, and then went onto Caldey Island, where he served as abbot. Instructed in a vision, St. Samson left Caldey, living for a while as a hermit near the River Severn. 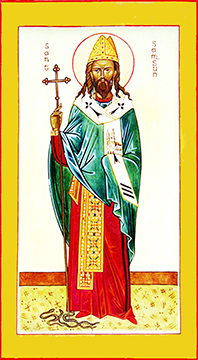 He then went to Ireland, and to Cornwall where his was consecrated bishop by St. Dubricius (14th November). St. Samson finally settled in Brittany, where he spent the rest of his life enlightening the Britons from his base at Dol. The exact date of St. Samson’s repose in unknown. Records show that he attended the Councils of Paris in 553 and 557, so he reposed sometime after 557. He was almost immediately venerated as a saint. Initially buried at Dol, St. Samson’s relics were later translated to Paris. VICTOR I, a native of Tunisia in North Africa who was the fourteenth Pope of Rome from circa 189 until his repose circa 198. Whilst he introduced Latin as the liturgical language in the Roman See, displacing Greek, which had been used since the See was founded, St. Victor is best known for his role in the Quartodeciman Controversy. Most sources list him as the first native of Africa to have been Bishop of Rome, and as a martyr.